QuietClad panels from Soundown are a damped metal product for use as an acoustic barrier, cladding, or enclosure material. Standard panels are constructed of aluminum and are available with a white polymeric coating or mill finish. QuietClad is often used in yachts and ships as engine room cladding, where it provides a damped acoustic mass layer and protects the A-60, A-30, or IMO-approved incombustible insulation. The acoustic performance of the installation can be improved by attaching it via an isolated grid, which is resiliently mounted to the supporting structure. 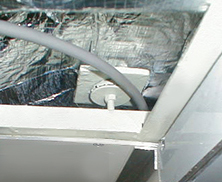 QuietClad also is used in a wide range of industrial applications, such as equipment enclosures, where its highly damped properties provide increased transmission loss without increasing weight. Other industrial applications include vibrators and material handling chutes. The detail below shows QuietClad sheeting supported on an isolated grid.